I have the cutest, most expressive beagle in the world. I know that Nukedad will disagree with that statement because he has two beagles himself, but I am fairly confident that he will say that he thinks Roxie is in his top ten. Anyway, Roxie and I shot some video yesterday for entertainment purposes only. But I’ll get to that in a minute. First I want to post (and in some cases, re-post) some of her finer poses. This last one? I had to include it because it cracks me up. 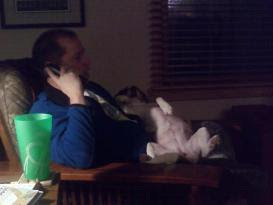 Jim was talking to his parents on the phone one night and Roxie hopped up onto his lap and flipped over for a belly rub. She stayed there, just like this, for a good, long time. Typical. As if all of that wasn’t enough hilarity for one day, check out the video I shot yesterday. The first one shows the routine we go through when I decide to take her for a walk. The way she tilts her head to the side when we say certain things to her cracks me up like almost nothing else. Words Roxie loves: walk, talk, chalk, caulk, rock, (because they all rhyme with “walk”, get it?) treat, food, hungry, “Where’s (insert boy’s name here? )”, outside…the list goes on and on. In the second one, I attempt to explain how I totally torture and torment her before finally giving her a treat. 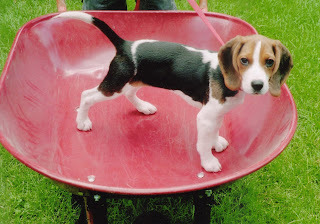 That’s the kind of fun we have around here with a crazy beagle. Now back to your regularly scheduled weekend! What, am I your only friend home on a Saturday night? Roxie is very, very cute! I love your rug, Melisa — can’t forget to say that part. My cat completely freaked out when Roxie started barking. I’m mom to a 6 year old and I’m hone watching a beagle on the internet, too. We need to do a girls night already! I’m home too! And let me say I love the rug, too, before I forget. THANK GOD YOU FACE BOOKED THIS AND I SAW IT TONIGHT because i needed those pics to cheer me up! I just love love love all those pics and the belly rub one is too funny. In one of the vids, i love how when she barks (first video) she turns her right ear inside out! You need to post some kind of Roxy video once a day… AT THE MINIMUM! She’s a total cutie! I get that excited about treats and tummy rubs too! So, now what? 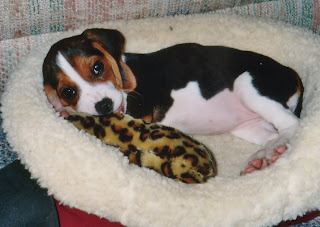 To best you in the “Beagle Wars” I’m going to have to post 25 pictures and 6 videos? This is getting out of hand. Surrender Dorthy, I’ve got you outnumbered 2 to 1. Although, Buddy thinks Roxie is “totally hot”. Michelle: You don’t get that excited over treats? I do. 🙂 Thanks re: the rug. It’s good ole’ Pottery Barn. I designed my entire living room around it and I adore it too! Melissa: Roxie was freaking out too, when I was playing it in her presence! Mr. Lady: You can borrow mine for a day if you come get her. Kim: If I posted a Roxie video each day, I’d become known as that crazy dog lady. I’ll have to stick to an occasional basis, because I’m already halfway there (with the crazy part, that is!). I was bitten (not that badly) by a beagle. 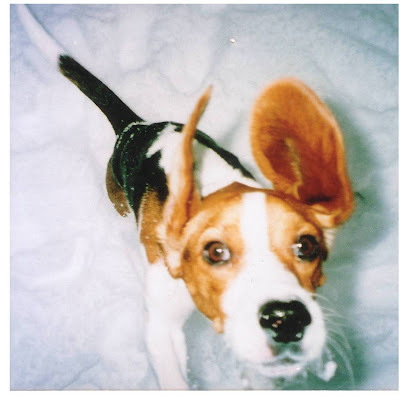 Didn’t help that I was pulling his tail while he ate dinner 🙂 Anyway, it seems I’ve held that fact against all beagles for 20+ years, but I can’t hold it against Roxy!! Way too cute. Next post: Breaker One-Nine, What’s Your Handle? Previous post: You Say Tiara, I Say Tiara.